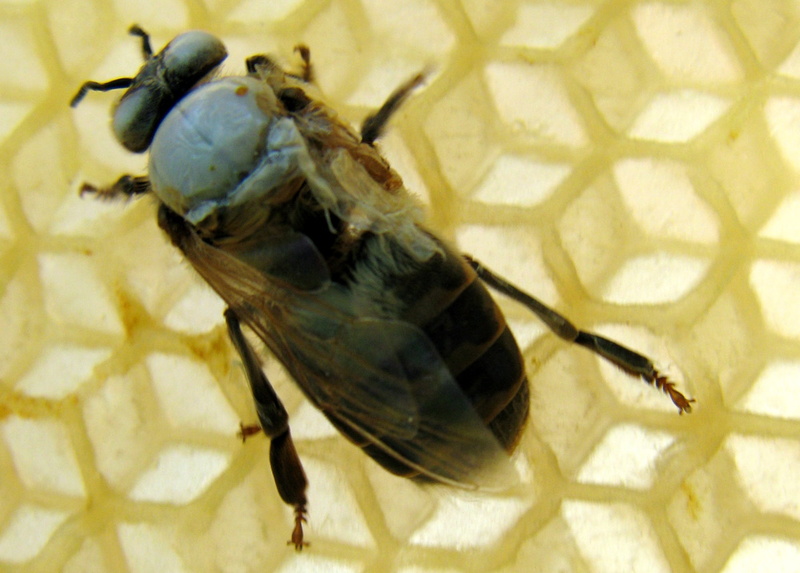 What is the White Bee Disease? Like ghosts, a few drones such as this one limped eerily through our hive last week. 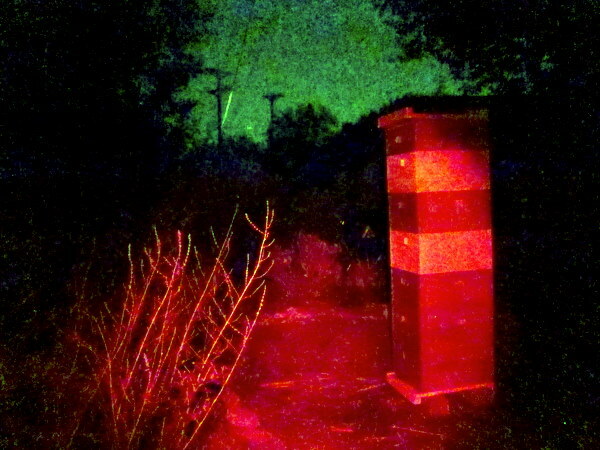 It’s a hive hosted at City of Albuquerque Open Space near the Rio Grande and we suspect deformed wing virus transmitted by varroa but aren’t quite sure. White Drone: Symptom of Deformed Wing Virus? Yes, there’s a deformed wing. Yes, we saw a few varroa on drones in the hives. But I can’t find a description in our bee books of the “whitening” of live bees. Can anyone offer further insight? Witness the “Bee Song” by Zach Sherwin aka MC Mr. Napkins at The Aspen Rooftop Comedy Festival 2010. One way I like to bolster a hive throughout the season is to combine it with a small swarm or other weak hive. It’s the lazy girl’s guide to solving common problems like uniting a queenless hive with a queenright hive or combining a couple small swarms into one strong colony. 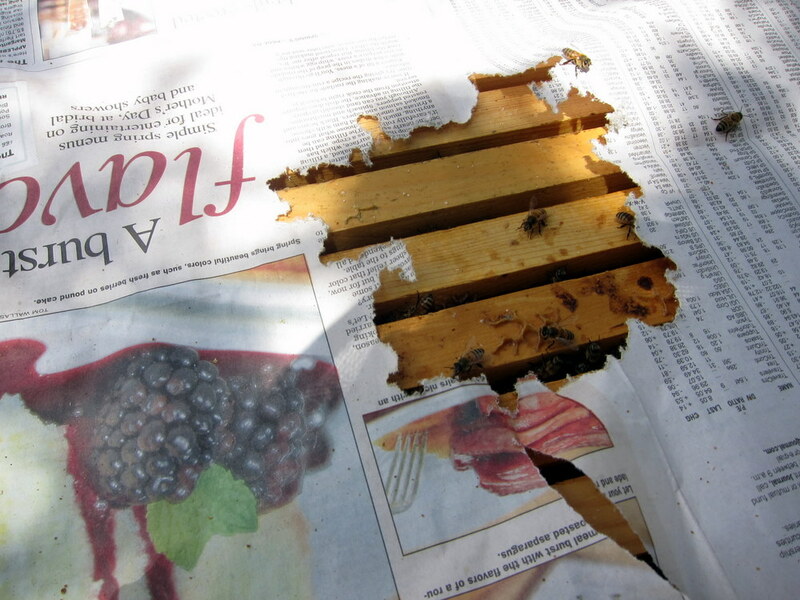 Day 3: Hives have chewed through the paper and combined, hopefully painlessly. 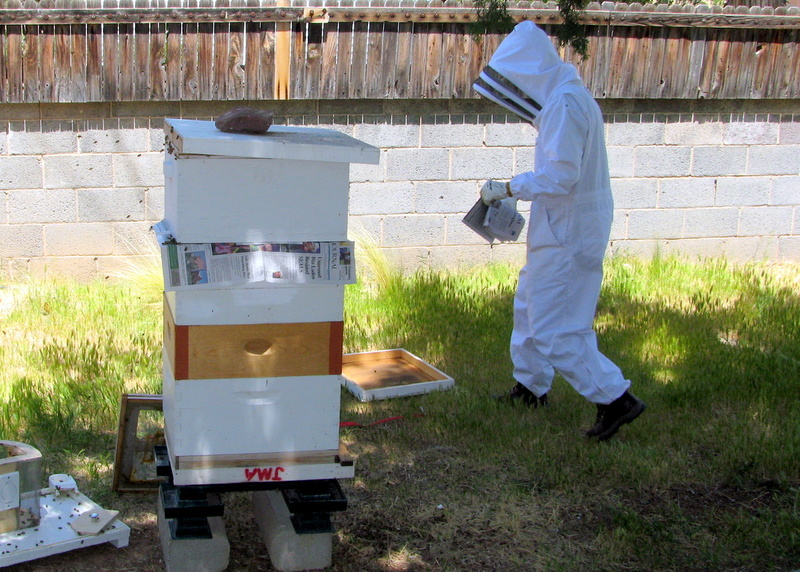 Take a small hive and remove the hive cover and inner cover. Place a piece or two of newspaper atop the frames in the top box. Cut a slit or two in the paper (optional). On top of this, add a box with your new colony or swarm. Close ‘er up and wait a couple days. OPTIONAL: Sometimes I leave a top entrance for the top box. Othertimes I don’t. Depends on the strength of that hive and how hot temperatures are projected to be. At night, because the bees are fanning, my whole yard smells of honey. It’s a monster hive, 6 deeps and 1 medium, and full of ripening honey. Despite our drought, my city bees have access to the well-watered trees of the neighborhood and the University of New Mexico and it’s clear they’re taking full advantage of their good fortune. Bums facing out with the tip exposed, the girls are typically sending a “homing signal” by revealing their Nasonov glands. This is done during swarming or orientation flights at a new hive. Here’s what Nasonov fanning looks like. What does fanning behavior look like? John Pluta from Georgia captures the stance of a fanning bee on video.